Our Put-in-Bay Golf Carts are available during the warmer summer months of the year. Because Put-in-Bay is such a popular island destination, there are many carts to choose from and rent. All three recommended golf cart outlets have high quality brand new Yamaha Golf Carts that rent out hourly, daily, and overnight and have great reviews. With more than 9 miles of paved mostly flat roadways, riding a golf cart is a fun, easy way to explore the Village of Put-in-Bay and the rest of South Bass Island. 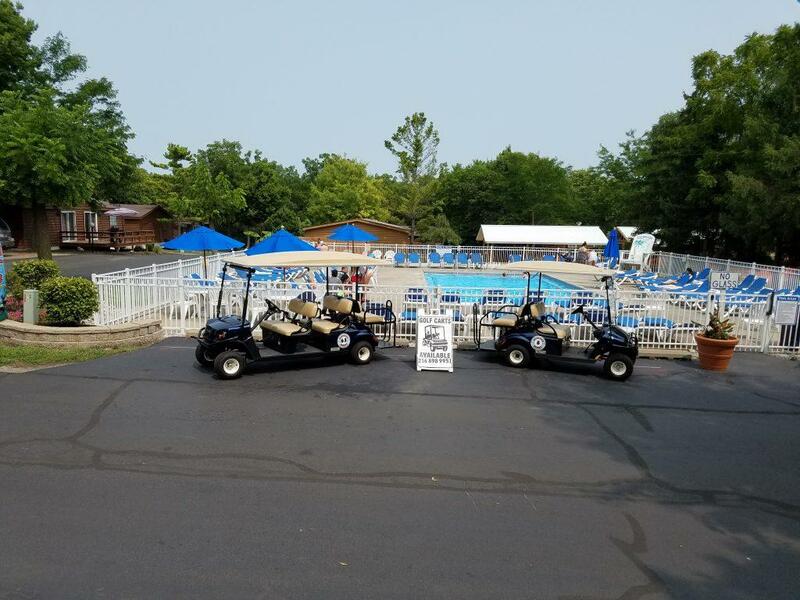 If you are staying at the Commodore Resort, Island Club Home Rentals, Victory Station Hotel, or Put-in-Bay Condos then you can have your cart delivered right to you onsite as part of our service. Put-in-Bay Golf Cart Depot rents their carts by the hour. 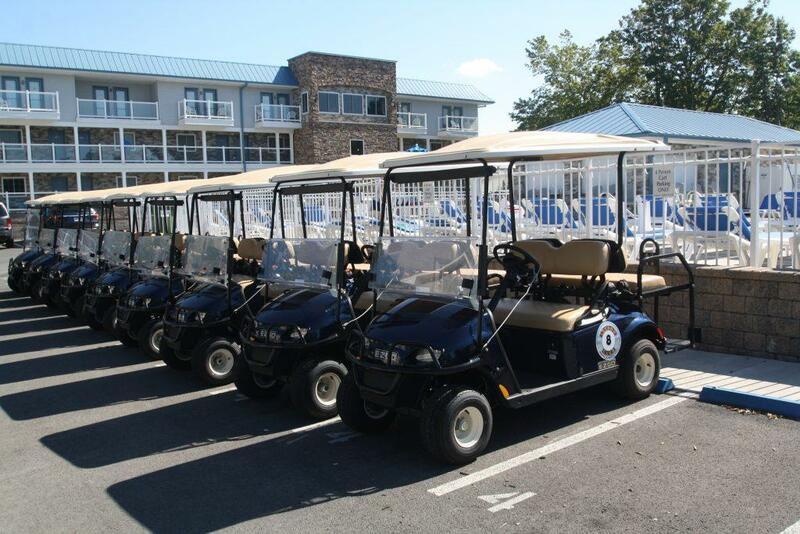 Island Club Golf Carts and Put-in-Bay Condo Carts rents overnight to their lodging guests only. Reservations are easy to make either in person or before your visit online (preferred). Prices are generally less that renting near the Miller Ferry Dock or Jet Express downtown. Golf carts are by no doubt the primary choice of transportation on Put-in-Bay Ohio. The unofficial report for number of golf carts on the island is over 800, with most of them being rentals. There are multiple sizes to choose from depending on your personal or group transportation needs. Island Club Golf Carts offers both 4- and 6- person carts regularly, and on occasion 8-person carts are available. They also offer a special rate when you reserve your cart online through their website, so save some money and BOOK A GOLF CART ONLINE! Proudly serving ONLY Put-in-Bay Island Club Rentals guests with a confirmed home or condo reservation! Rentals are daily and you can keep your cart overnight without going through the hassle of returning it each evening and picking it back up in the morning like at other rental businesses. Rentals are for guests only but if you just need a cart for an hour or three, check out Put-in-Bay Golf Cart Depot. Grab a Put-in-Bay Taxi to get downtown. Our 2 person electric golf carts are a fun and quick way for couples to cruise the island for the day. If you’re bringing the kids, our 4 seat electric will be a big hit also. Our golf carts are super safe with retractable seat belts to keep your precious cargo safe and secure. Total relaxation is assured with this smooth and quiet ride. All Put-in-Bay Golf Cart Depot carts are powered locally by Crown Battery in Fremont, Ohio. Our 4 and 6 seat gas-powered golf carts are your passport for overnight and weekend fun or even a week long rental. We have a newer fleet of Yamaha fuel injected carts that will enhance your visit to our island paradise. At over 35 MPG, running out of gas is never an issue for your multiple day or weekly golf cart rental. These carts leave all the others eating dust! If you really want to step up your game, try one of our CUSTOM YAMAHA Adventurer Sports. These carts offer a 3 inch lift kit, sporty tires and wheels with a fold down back seat for hauling groceries or gear if needed. These are the finest rentals available on Put-in-Bay, offering a great value in your overall vacation experience. 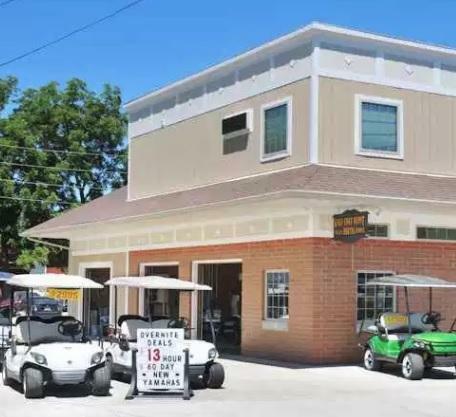 Put-in-Bay Golf Cart Depot is located on Catawba Avenue, just a short walk from the downtown ferry, up Delaware Ave, next to the Reel Bar. Located behind the airport off of Langram Rd, the Put-in-Bay Condos are the newest and most luxurious lodging accommodations on the island. All units are on the water and provide beautiful views of Lake Erie. Adding to the amenity list at this location are taxi service and golf cart rentals. Golf carts are the ideal method of travel on the island since it is so small. Everything is quick and easy to get to on a golf cart and it takes no longer than 15 minutes to get anywhere on the island. Local online forums have placed these rentals first place in terms of service and guest relations. Stop by for an overview of the Condos in general and the Golf Carts in particular. Or visit www.putinbaycondogolfcarts.com for more information.